The audio is edited from remarks Reagan made during his lifetime. The computer-generated imagery was created starting with a silicone cast of Reagan’s head that was photographed from various angles with 300 cameras. 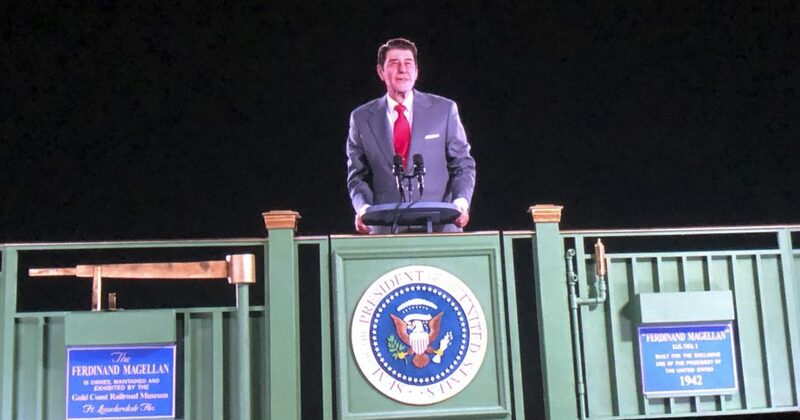 His head was then digitally “placed” on the body of an actor portraying the president with full costumes and backdrops for the three scenarios. Reagan’s face comes to life via specific movements of the mouth, nose, eyes, cheeks and hairline manipulated by computers. Are you glad that technology has made it possible to bring Reagan back to life? “It’s fun to think that he’s standing in front of us,” said Drake, who’s now the chief administrative officer for the foundation.